Patagonia was founded in 1973 in California, as a branch of the original Chouinard Equipment company, after it split. 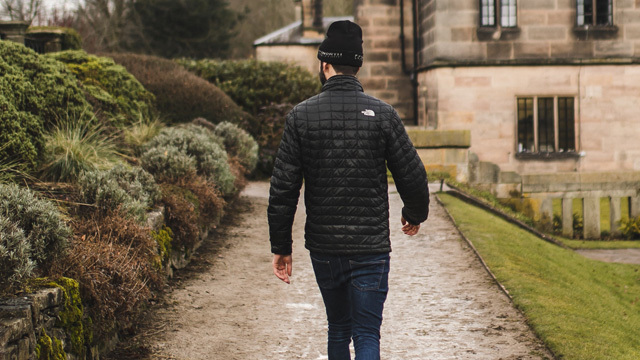 It is nearly impossible for anyone looking to purchase jackets online not to come across this brand, as it is one of the most popular ones in the U.S and also other countries, too. Not only do they make some of the best performing products currently on the market, but their seriousness in helping the environment and reducing their impact on nature are also other factors that contribute to the brand’s popularity. These make it a great choice for those looking to buy from sustainable brands and who are striving to minimize their ecological footprint. You’d be glad to know that Patagonia use only traceable and responsibly sourced raw materials that are of natural and animal sources, and their synthetics are nearly all sourced from recycling. Let’s now turn our attention to today’s jacket of joice, the Nano Puff design, which is a winter jacket made to withstand low temperatures and moderate weather conditions. It is a hoodless design, with a high collar that protects the neck and also prevents the cold from getting through, along with the elasticized sleeve cuffs and adjustable hem, all of which close the jacket off from the elements. The style of this jacket is quite versatile as it looks like a jacket that can be worn on your day-to-day errands, while at the same time being suitable to take with you on your next hiking trip. The brick wall quilting is both a design detail that adds to the appearance of this jacket, while also being a performance detail that helps evenly distribute and keep the insulating padding in place. It is a regular-length jacket, suitable for early winter and during seasonal changes between Autumn-Winter and Winter-Spring, as the weather is milder and the temperatures a bit warmer. It is cut to fit snugly on the body, so that should be kept in mind if you intend on layering underneath, as you might have to order a size bigger to have it fit better. Nano Puff is packable into its own internal pocket, which then zips to create a small pouch that you can easily take with you while travelling as it takes barely any space. There are two front pockets on this jacket, both with zipper closures and on the inside there is only one pocket, the one mentioned above. Between the women’s and men’s versions the difference is very minimal, and it’s only noticeable in the cinched waist of the women’s design. Nano Puff is made of 1.4 oz 22-denier 100% Recycled Polyester, which, along with the DWR coating, give this jacket water-resistant qualities and also mild wind resistance. 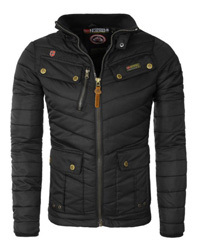 However, it is a jacket best suited for dry conditions or preferably worn with a waterproof layer on top. Moving on to its insulation, it is PrimaLoft® Gold Eco, a 100% Polyester, more than half of which is sourced from recycled polyester. PrimaLoft is a renowned synthetic insulation that comes in a variety of types, all of which are made to mimic the performance of the best insulator available, Down. 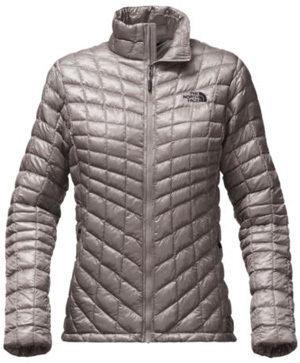 We have previously looked at the differences between this synthetic insulation (PrimaLoft) and Down in this article, as well as have compared the two. This is a lightweight jacket and due to its materials (especially the insulation) it is fast drying and really easy to care for. The North Face is another very well-known brand when it comes to outdoor clothing, and its products are popular among those who prefer high performance pieces which also come in stylish designs. Founded in 1966, The North Face is an American brand that originally made backpacking and climbing equipment, which were in high demand at the time. Over the years the brand’s product line has expanded considerably and, although the performance of the products is quite commendable, there has been a slight move towards designs that are fashionable and easier to make part of the everyday wardrobe. 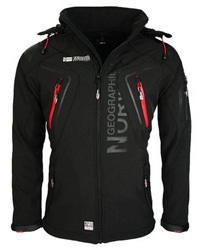 ThermoBall is a winter jacket that is designed to be used during seasonal change and early winter. However, with sufficient layering it can be worn during very low temperatures, too. Style wise, it is a casual design that comes with a medium, stand-up collar and elasticized sleeve cuffs. It is quilted in a block design and the padding is also distributed throughout the sleeves. There are two side pockets on this jacket, which serve as hand warmer and carrying pockets, and also an internal pocket. ThermoBall is a packable jacket, which packs into its hand pocket and is easy to take with you as it weighs very little and compresses into a small size. It has a full-length central zipper, which is concealed to prevent water from leaking through, because the jacket is also considerably water-resistant and suitable to wear in unstable weather. However, as with all insulated jackets, it would be preferable to wear it in dry weather. The hem is adjustable and cut straight, whereas on the Nano Puff it has a drop tail cut that covers the back. 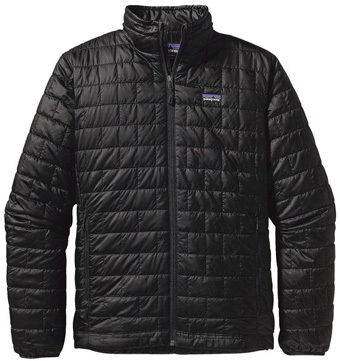 ThermoBall is a roomy jacket, especially the men’s version, and it allows plenty of room for layering underneath. The difference between the men’s and women’s versions is mainly in the slightly cinched waist of the women’s version and the mixed quilting pattern, which in the men’s version is in a straight block design. Another detail to add is the wide range of colors available on both versions, which provide plenty of options to choose from. ThermoBall is made of 100% Nylon Ripstop fabric, which is highly durable and has also been treated with DWR coating in order to improve its water resistance. 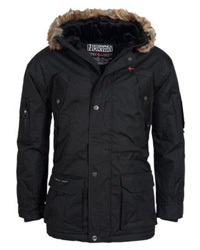 This is a winter jacket, which is insulated with synthetic ThermoBall insulation. ThermoBall™ is the brand’s own developed insulation, in partnership with PrimaLoft®, and it is made to closely mimic down not only in performance, but also in its shape, by being shaped into small fluffy clusters, like those of natural down. Other insulators available are usually either made into thin and small filaments or rolled rather than being round. This particular shape helps ThermoBall trap more heat, thus providing much better insulation. In fact, an independent study by the University of Kansas has found that ThermoBall, as an insulation, is comparable to 600-fill power down, which is quite warm considering that it is made of polyester. We have previously compared this insulator (ThermoBall) to down in this article. As a jacket, ThermoBall weighs around 12 oz (0.33 kg) and, just like Nano Puff, is quite easy to maintain and care for. Insulation, in this case, is used to refer to the ability of a garment (a jacket in our case) to maintain body heat by trapping it using the insulating padding. This, in turn, is what determines how warm a jacket actually is. Thus it’s not the jacket that creates the warmth, but its ability to retain the warmth emitted by the body. When comparing these two jackets, ThermoBall is the warmer option out of the two. While neither of these jackets is suitable to wear in extremely low temperatures, ThermoBall would be the easier one to work with when it comes to layering for harsher weather, especially since it is also cut to fit a bit bigger. The difference is due to the insulation used in each. While both ThermoBall and the Gold Eco are part of PrimaLoft’s creations, ThermoBall’s shape is what gives it the upper hand, as we mentioned above. In regards to weather resistance, they are both water resistant designs but, as we said previously, it’s best to wear them in dry conditions. However, a huge plus of them being insulated with synthetic insulation rather than down, is that even if you were to get wet, it would not be a major issue as PrimaLoft’s insulations perform quite well even when wet, unlike down, which is practically useless if it gets wet. These jackets also dry quite fast and, in the case of ThermoBall, the insulation is made to be non-stick, meaning that, even when wet, the clusters won’t clump together, thus providing better insulation during wet conditions. Both jackets are coated with DWR products, which add to their ability to withstand rain, however, again, it’s best to rely on another waterproof layer on top if the weather is unpredictable. The good thing about both of them is that they are so small when packed, that it’s a non-issue to carry a rain coat with you. As for wind-resistance, Nano Puff is the better option as it is much more adept at withstanding strong winds. 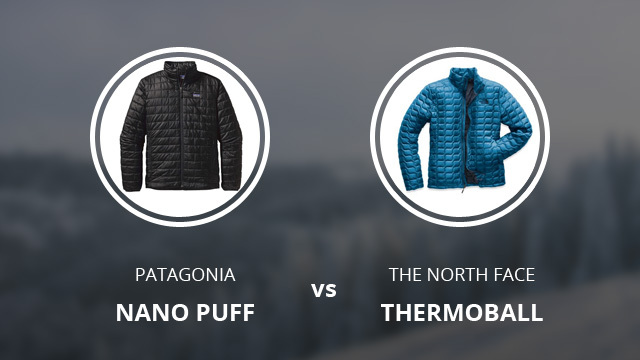 When it comes to their quality, there isn’t much to compare as both of these jackets are very well-made, however, by a very slight margin, the overall consensus online is that the Nano Puff is built better and also has better durability than the ThermoBall. In regards to fit, Nano Puff also fits better as it is more tapered rather than being as roomy as ThermoBall. However, as we said previously, if you are getting either jacket for layering, then the latter is better. For overall wear, however, Nano Puff is the better suited one. It also has a drop tail hem that covers the back much better, which is an added plus if you intend on biking with either of these jackets. The price of these brands, and even these jackets, is quite up there. Neither Patagonia, nor The North Face are very affordable when it comes to their more technical and winter wear. When it comes to these two jackets ThermoBall is slightly cheaper than Nano Puff, but they both average at around $200-$300 depending on where you are looking. Overall, Patagonia tends to be pricier as they make really high-performance pieces, whereas the more casual and style-focused The North Face’s pieces are cheaper. Why are The North Face Jackets so Expensive? Are They Worth the Price? Why is Patagonia so Expensive? Are their Jackets Worth the Price? To give you the clear cut answer as to which one you should choose would be quite difficult as the differences between these two jackets are not that many. 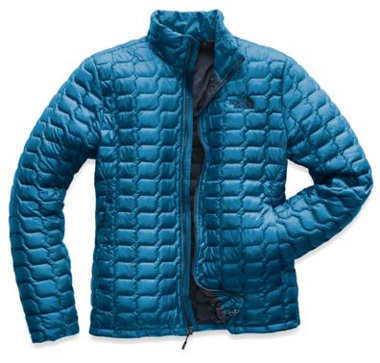 For a better fit and overall better look, Nano Puff by Patagonia is the jacket to go for. It is and looks very well-made and it fits quite comfortably, while also being wind-resistant. But, if you are looking for a jacket that is quite warm and you intend to make it through winter with that one only, then Thermoball is better suited for lower temperatures out of the two. It tends to fit big on the body, but on the other hand it leaves quite some room for layering underneath. 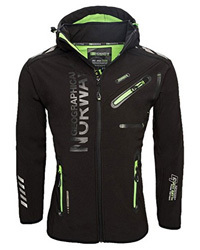 It’s unlikely to go wrong with either of these jackets in regards to their overall performance, therefore it comes down to which fit you prefer better and the design which is more suitable for you.